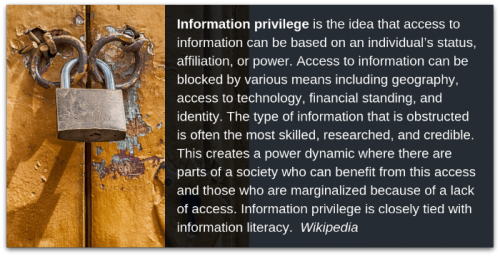 I had not heard of the concept of “information privilege” before reading Joyce’s thoughtful and comprehensive post earlier this month. But it certainly seems logical. Our students come to us from a variety of situations, not just of nutritional adequacy, home stability, and family support, but also of informational access. Keep school libraries well-staffed. While “information” can be found in staggering quantities online, the skills to find, evaluate, and use these resources need to be taught by a skilled information professional – a school librarian. Sadly, these positions are often scarce in schools serving less affluent populations and are often on the chopping block whenever budget cuts are made in all schools. I find it ironic that when all signs point to information literacy being one of the most critical skills needed by our future workforce, we do not give a high priority to funding the positions of those who help develop this literacy in both students and staff. Keep our Internet access as open as possible to all learners. Even as an ever greater number of schools implement 1:1 programs and find ways to give students home Internet access, the call for restricting what can and cannot be accessed on school networks increases in volume. While games, videos, social media, and other Internet sites of high interest and entertainment value can be challenging for teachers to compete with for attention, blocking such sites discriminates against students for whom school resources are their only source of Internet access. Netflix, YouTube, game sites, and even Instagram, all have uses that have educational benefit and increase information literacy. Connect our learners with public information resources beyond the school. Our students need to understand resources available to them as citizens after they leave our schools. Public library access should be part of all students’ public school experiences. Students should know about databases, e-book collections, and other materials available through state library programs, as well as other state government resources. Students should be give practice in using free federal information collections. Not knowing about or not knowing how to use these public resources will exacerbate the chasm between those of information privilege and poverty. Growing up in the 1950s and 1960s, I was information privileged, despite living in what now might be considered an “information desert.” I had books at home and my parents subscribed to a daily newspaper and magazines. Our secondary school had a good library and a professional librarian. Our public library was a regular stop when we came into town from the farm. I had an AM transistor radio and we had a black and white TV that got in 2-3 over the air channels. My family valued education and reading. Today’s children and young adults operate in what I call an information “jungle.” Those who enjoy information privilege today, don’t just have resources, but the skills to use them well. Is your school helping make all its students information privileged?